Melissa Ben-Ishay is a mom, baker, and founder of Baked by Melissa, the New York City-based brand famous for its signature, bite-size cupcakes and treats. 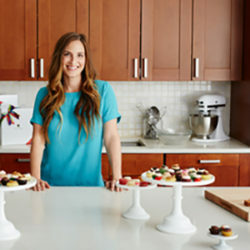 Passionate about baking since childhood and with the idea that people should be able to taste more flavors without a post-dessert guilt trip, she decided to do what she loved and launched Baked by Melissa in 2008 after being fired from her job in advertising. Melissa will be teaching “Decorate with Melissa of Baked by Melissa” during Friday’s schedule of activities. Today, the company operates 14 stores and ships nationwide. Ben-Ishay currently serves as the company’s President and Chief Product Officer. In October of 2017, she released her first cookbook, Cakes by Melissa.